What does showing up to church on Sunday have to do with getting my kids ready for school on Monday? Engaging in a casual conversation with my neighbor while taking out the trash on Wednesday? Finishing up work in the office by Friday? Or even watching football all day Saturday? The answer is EVERYTHING…or NOTHING, depending on whether my theology of Lord’s Day worship shapes my understanding and practice of everyday discipleship. In recent years, however, the worship/discipleship pendulum seems to have swung further in one direction than ever before. A recent Pew study, for example, reveals that while more Americans today than ever before now identify themselves as being spiritual but not religious, ironically the second largest percentage of this group (thirty-five percent!) still call themselves Protestants. Certainly, a large majority of this group could include those with loose nominal ties to mainline (liberal) denominations. 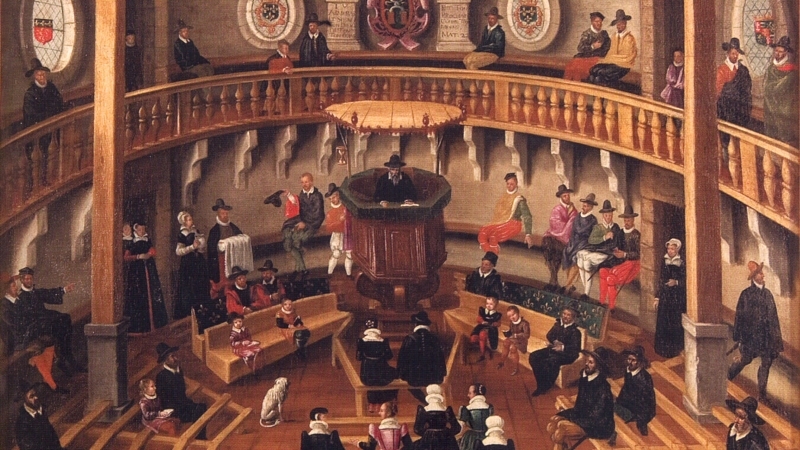 In any case, researchers have concluded that “the growth of ‘spiritual but not religious’ Americans has come mainly at the expense of those who say they are religious and spiritual.” This trend cannot bode well for the survival of the church as an institutional entity, especially as its adverse effects are now being felt among today’s evangelicals. While many outside the church have been busy outsourcing and privatizing their spirituality, even within the church discipleship ministries and programs are easily and often pruned from their institutional roots without much alarm or concern. And why should there be? After all, “it’s not about religion,” we’re told, “it’s about having a personal relationship with Jesus”—a self-legitimizing creed often confessed by some who just want to “love Jesus,” yet without hesitation see no problem with “leaving the church” to do so. Especially today, with an embarrassment of discipleship riches now literally at our fingertips (books, podcasts, devotionals, etc.) and para-church ministries in some cases supplanting the role of the local church, never before has it been easier or more popular to boast about “being” the church without ever actually stepping foot in one! But what if everyday discipleship is unsustainable apart from gathering corporately as the church for public worship on the Lord’s Day? These “Spirited practices” include nothing novel but simple, ordinary means of grace—a preacher with an open Bible, a table with bread and wine, and some occasional water. Despite these ordinary elements and seemingly mundane religious practices, however, as ordained means they not only provide the way for us to offer acceptable worship to God, but also a way for us to be discipled by the Lord himself while doing so. In the context of corporate worship then, discipleship proves to be more than just a cognitive experience or discipline that involves transmitting biblical and theological information. It becomes so much more—a weekly reorientation, grace-filled covenant-renewal in which the Lord himself addresses us with transformative gospel truths for the ultimate purpose of worshiping him, yes, but also for the immediate purpose of encouraging and strengthening us as disciples for discipleship. Worship is not just something we do on Sunday; it does something to us as well (Rom. 12:1-2). Corporate worship is therefore not just one of many means of discipleship precisely because it is unique from all other forms of discipleship. What the church gathers to do on Sunday, in fact, is not something that can be relegated to or replicated in any other discipleship format or setting. It may seem at times to be less practical and expedient to our spiritual sensibilities but will ultimately prove to be the most transformative spiritual discipline we have to choose from over the course of our Christian lives. Because God is present with us, by his Spirit, addressing us with powerful truths and promises of who he is, what he is like, and the salvation he brings; week in and week out we are constantly confronted and challenged with the status quo of our sinful selves and imperfect lives—the harsh reality that we do not always love our neighbors as ourselves, that we aren’t always as patient with our children as we should be, or as faithful in redeeming the time as we could be, whether it’s how efficiently we go about our business in the office or how leisurely we spend our weekends relaxing on the couch. God-honoring, Christ-exalting worship then is the key to avoiding such self-flattery. It reorients our perspective of who God is, who we are, and how then we should live, not by accommodating to our own spiritual inclinations but confronting us with a “disorienting haunting of transcendence,” while at the same time reminding us that while “our God is a consuming fire” (Heb. 12:29), still “with confidence [we] draw near to the throne of grace, that we may receive mercy and find grace to help in time of need” (Heb. 4:16). This confidence comes not from what we have to offer him but because he offered himself for us—“him who for a little while was made lower than the angels, namely Jesus, crowned with glory and honor because of the suffering of death, so that by the grace of God he might taste death for everyone” (Heb. 2:9). Clothed in Christ, we therefore stand in the presence of the Holy One as sinners and yet we are not consumed! Instead, we are invited to join the heavenly anthem singing, “Holy, holy, holy is the Lord God Almighty, who was and is and is to come” (Rev. 4:8). Let us strive therefore to become faithful disciples by first becoming fervent worshipers, “not neglecting to meet together, as is the habit of some, but encouraging one another, and all the more as [we] see the Day drawing near” (Heb. 10:25). Michale Lipka and Claire Gecewicz, “More Americans Now Say They’re Spiritual but Not Religious.” September 6, 2017, http://www.pewresearch.org/fact-tank/2017/09/06/more-americans-now-say-theyre-spiritual-but-not-religious/. James K.A. Smith, You Are What You Love: The Spiritual Power of Habit (Grand Rapids: Brazos Press, 2016), 68. John Calvin, Institutes of the Christian Religion, accessed December 26, 2017, http://www.reformed.org/books/institutes/books/book1/bk1ch01.html.